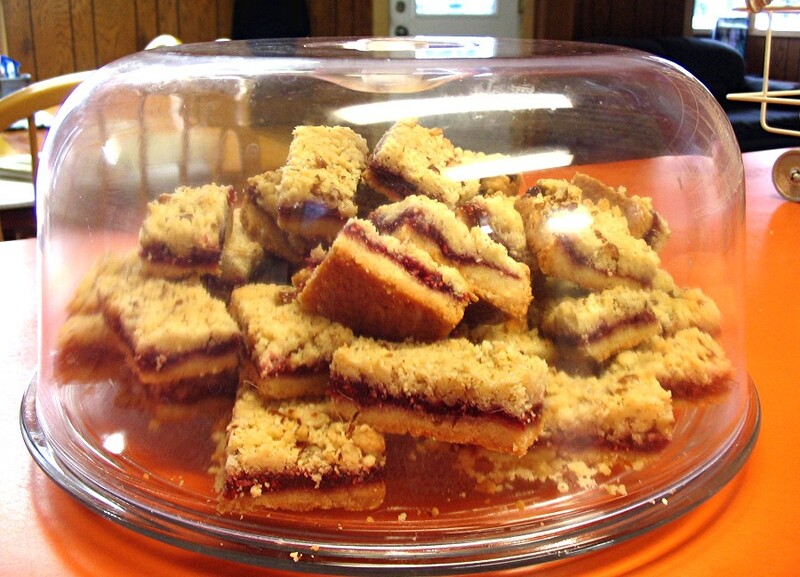 Everyone loves these raspberry bars, they have an ultra-buttery shortbread crust topped with cooked raspberries and a streusel topping. They are very sweet, buttery, tender AND they cut nicely...perfect for gift giving. Raspberries grow well in Alaska, so if you are lucky enough to have some in the freezer, this is a wonderful recipe for them; I'm not so lucky, so I used a 12 ounce bag of frozen raspberries. NOTE: You can skip this step if you want to use raspberry (or ANY flavor) jam. Put the berries (no need to thaw) in a heavy saucepan with 1/4 cup of water and one cup of white sugar. Bring to a boil over high heat, then reduce the heat to medium high and simmer the berries until thick (I turn mine down to a medium low heat for a gentle boil and cook them for about 15 minutes, stirring once in a while). Set aside to cool (they will thicken even more as they cool). 21 tablespoons of butter, melted and cooled to room temp. Mix everything in a stand mixer: it will make a very stiff dough. Remove TWO CUPS of this dough and pat it evenly into a parchment (or foil) lined 9 x 13 pan. Chill in the refrigerator for 30 minutes (or freezer for 10 minutes). Remove and prick the dough with a fork. Bake the 9 x 13 chilled pan of dough, on the middle rack of your oven, for 20 minutes at 325°. After 20 minutes, the dough will still be very pale in color and will not have any golden color on the edges. Remove it from the oven and spread the cooled raspberry filling (or jam) evenly over it. To the reserved shortbread dough(that you set aside), add 1/4 cup of granulated sugar and 1/2 cup of chopped pecans. 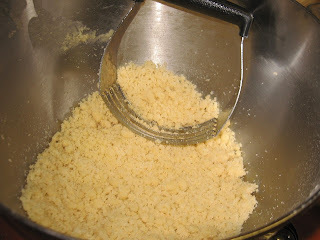 Use a fork to break up the dough into crumbs. Sprinkle the crumbs evenly over the raspberry layer and press ever so lightly. Bake on the TOP rack of a 350° oven for 25 minutes (my electric oven takes 32 minutes). The topping should be a golden color (watch the crumbles towards the end of the baking time so they don't get dark). Cool baked bars (in the pan) on a wire rack for at least an hour or until completely firm. When the bottom of the pan is completely cool to the touch, lift the bars out of the pan by pulling on the flap ends of the foil. Cut into 2" bars. These will keep at room temperature for a week. 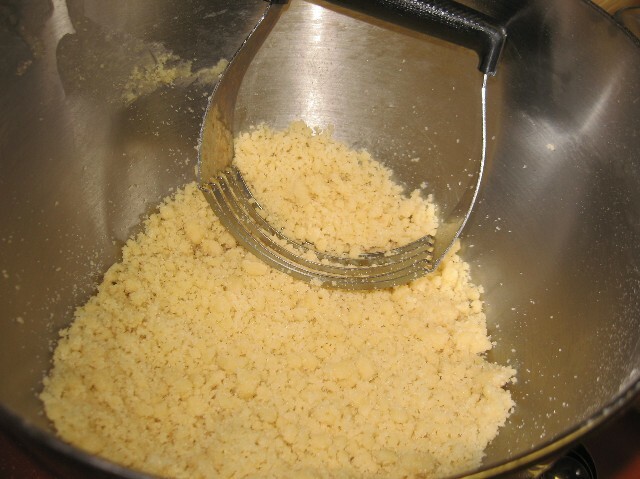 NOTE: The butter measurement of 21 tablespoons is not a typing error. NOTE: Line your 9" x 13" baking pan with parchment (or foil) and leave the ends of the foil a little long, so you can use them as handles to lift the cooled bars out of the pan. 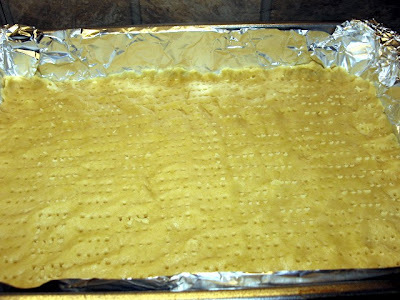 You don't have to grease the bottom of the pan because there's so much butter in the shortbread, but DO spray the sides of the pan/foil with cooking spray so the jam doesn't stick to the sides. NOTE: Pay attention to baking temperatures. The first crust pre-bake is on the middle rack at 325°. The final bake is on the TOP rack at 350° so that the bottom of the crust doesn't get too dark. NOTE: You can use any flavor jam you like. Very nice Coleen. I love raspberries. This recipe calls out to me! Oh,oh, I couldn't speak for a minute. We have to make these bars this morning! My mouth is watering as I write this. 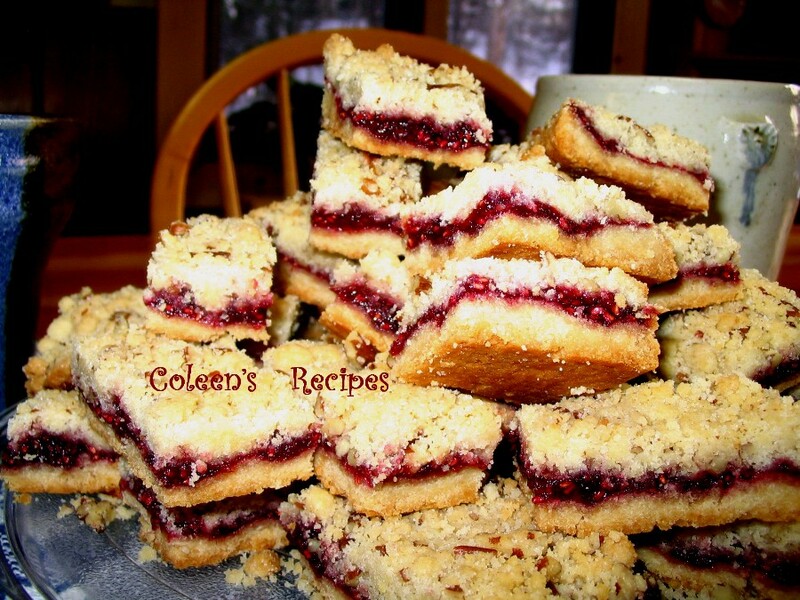 Thank you so much, Coleen, for this awesome recipe treat. YUM! I want these, like, right now!!! You had me at "raspberry..." Coleen, these look too, too good! Can't go wrong here with shortbread and berries. I imagine blueberries could be subbed too. just wondering ... is this recipe for the Rasberry shortbread bars is the same as what is pictured at the top of your blog banner?? 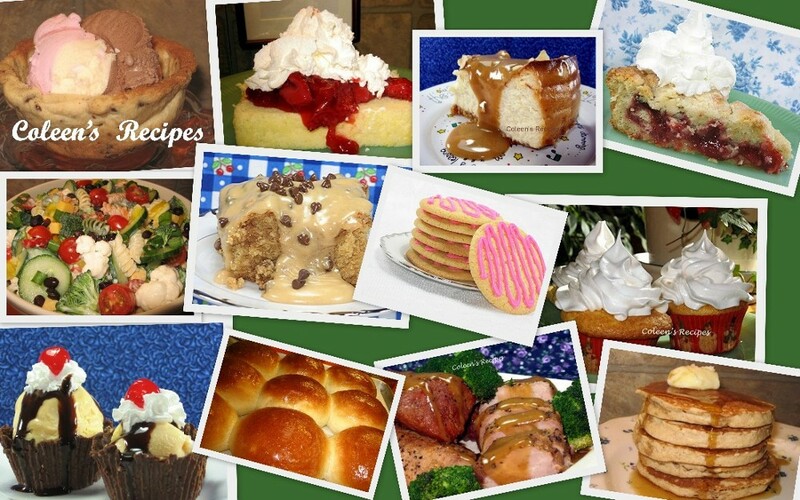 Top right ..... by the eclair cake? Thanks! the picture up top looks yummy! if you get this, you can email me the answer at KillianPGG@aol.com .... thanks! Delicious bars! I skipped lining the pan with foil and just lightly greased my pan, used my mixer instead if a wooden spoken and next time, would make more of the raspberry filling, I would like that layer a bit thicker! Otherwise, this is a decadent recipe!